What is a circular saw guide? How this type of tool can help you cut precisely and accurately? A circular saw guide is an instrument (or one of the many accessories for circular saw) that allows you to guide a circular saw in a straight line, hence its name. You could use anything as a circular saw guide starting from a simple wood plank and ending with manufactured guides with circular saw clamps, measurements, handles, etc. 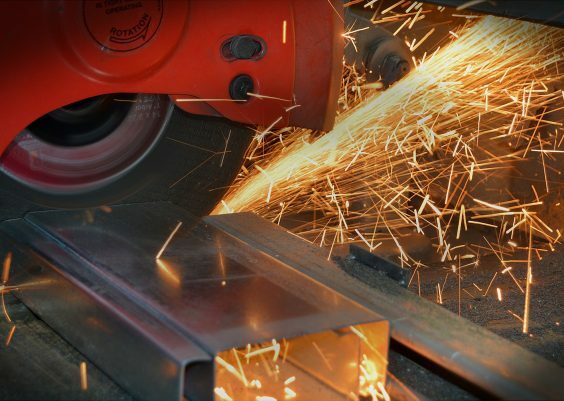 If you direct the circular saw manually along the surface of the workpiece, there is only so much you could do to ensure that it goes in a perfectly straight line. In fact, if you need precise straight cuts, then you wouldn’t be able to achieve them manually. That’s when circular saw guides come into play. A precisely made saw guide would allow you to make as straight cuts as you need. You probably wouldn’t be able to reach similar results manually. 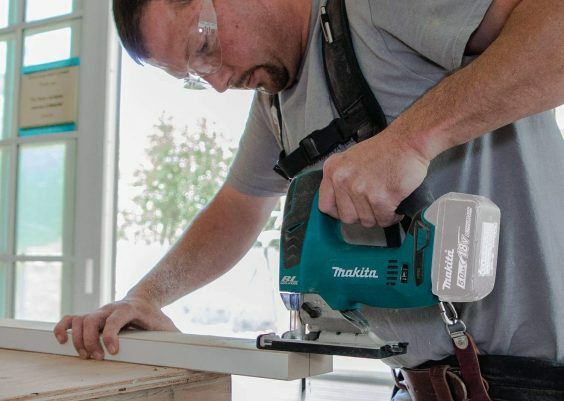 Whether you are going to make a circular saw guide yourself or you will be buying one, it certainly is worth the investment, especially if you are working on projects that require high precision. 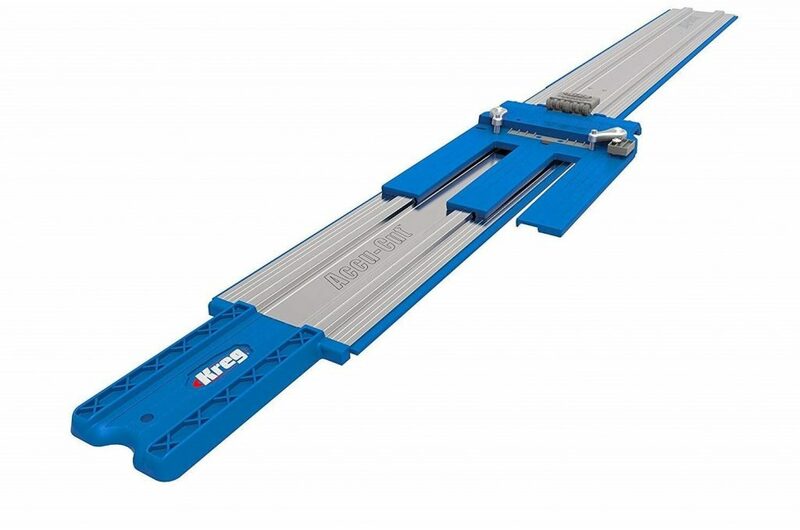 Kreg KMA2700 may be an excellent choice of a guide for you if you are looking to make effortless straight cuts. KMA2700 circular saw track features a mount that you screw your circular saw onto. The mount is run along the whole length of the track, allowing you to make straight cuts with little to no effort. Speaking of the track, it is 48 inches long. 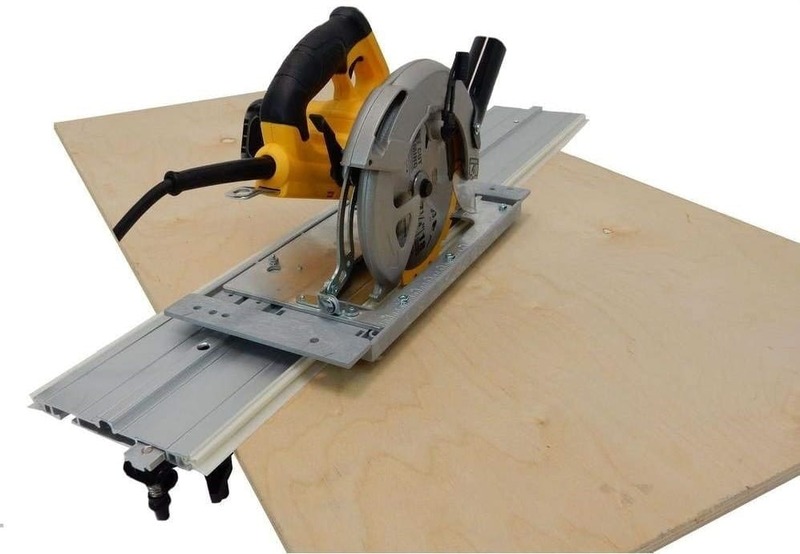 The KMA2700 circular saw guide can be installed on plywood, panels, or MDF without any clamps. Instead, it uses anti-slip guide strips to keep the guide in place. This also allows making angled cuts since you aren’t restricted by any clamps. A thing that this guide lacks is a measurement scale. Prior to working, you would need to do all the measurements with a ruler and make all the necessary markings. Emerson Tool Co. C50 clamping tool guide differs quite a bit from the KMA2700. Rather than mounting your circular saw on the guide, you just run it along its edge. Basically, C50 works like a long and large ruler. 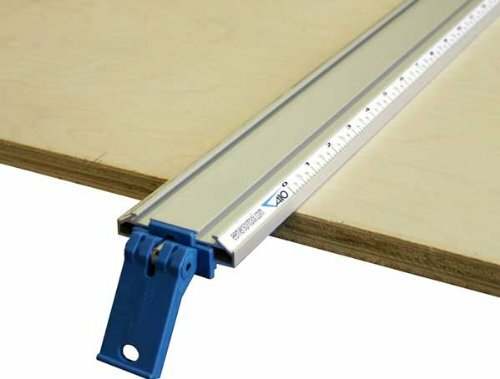 But unlike a ruler, the C50 can be clamped to plywood or any other working surface. You don’t get as much flexibility from this guide as from the KMA2700, but you may get more stability thanks to the clamps. The length of the C50 circular saw guide is also good: it has 50.25 inches between the jaws. And besides, this guide has measurements on it, allowing you to minimize the number of tools you use. Kreg KMA2675 could be an excellent choice of a circular saw guiding system for very long workpieces. That’s because this thing is used in a slightly different way than a regular guide. 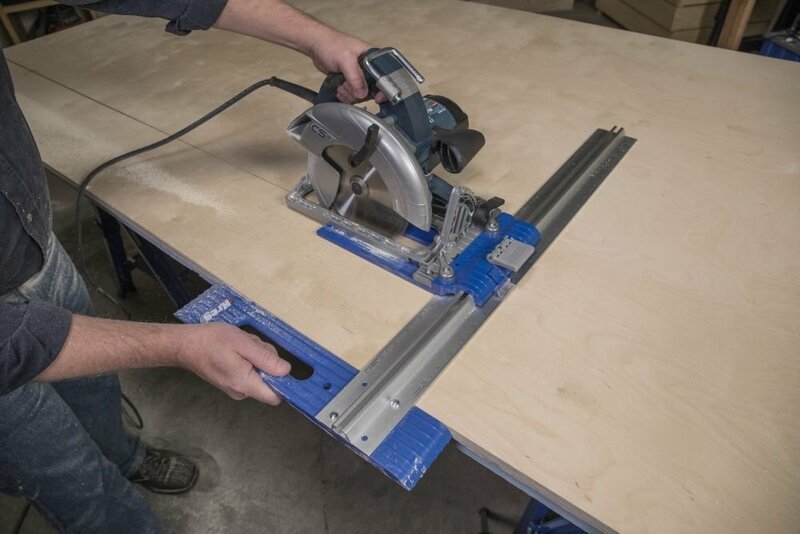 This circular saw guide is designed to be moved along the surface of the table while cutting. You, first of all, set the width of the cut using the measurements on the track. Then, you install your circular saw on the mounting plate that is identical to that of the KMA2700. Lastly, you use the guide arm to run the circular saw along the workpiece’s surface. The guide arm is reversible to allow both left and right-hand use. Besides, the circular saw mount accepts right and left-bladed circular saws. The range of adjustment of this circular saw guide is 1/8 – 24 inches. While this guide won’t allow you to easily do angled cuts, it would be suitable for making cuts in very long workpieces. Alternatively, you could use it to cut several workpieces in one go. The KMA2685 circular saw guide is pretty much identical to the KMA2675. The KMA2685 is the newer version of the 2675. The only difference between the two is the edge guide: in the KMA2685, it is much larger and thus more convenient. As for the rest, there aren’t any differences between the two circular saw guides. They both have the same circular saw mount, width adjustment, and design. If you want your circular saw guide to be more convenient, then the KMA2685 would be a better choice. If you want the most versatility from a circular saw guide, then have a look at this kit. 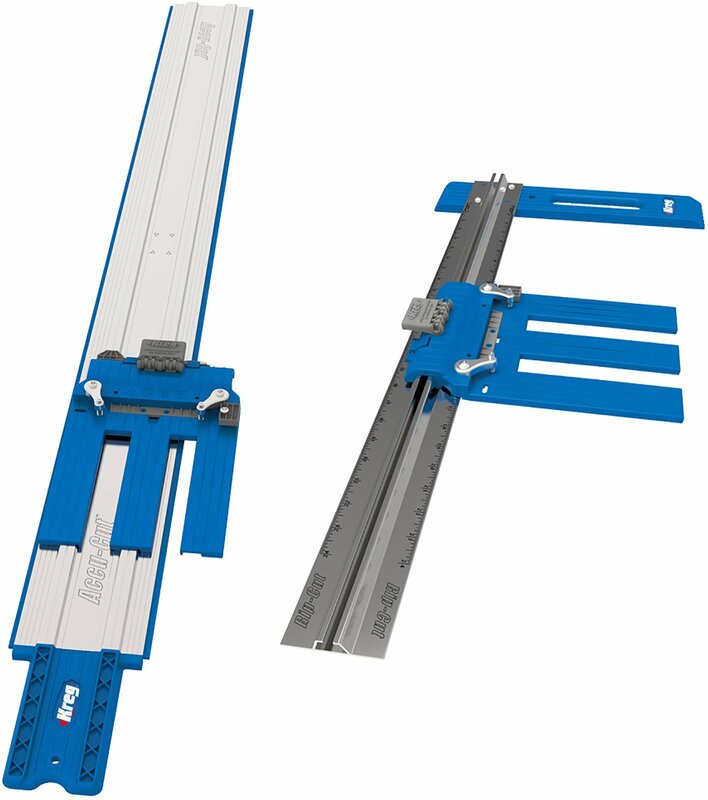 The Kreg KMA2700 & KMA2685 kit includes the KMA2700 Accu-Cut circular track guide and the KMA2685 Rip-Cut saw guide, as the name suggests. We reviewed both those guides a bit earlier, as you could have noticed. With this kit, you get the ability to, on one hand, make various straight and angled cuts with the KMA2700 and on the other to make cuts in long or several workpieces. If you are looking for something that would work in a variety of projects, then this kit may be the right choice for you. 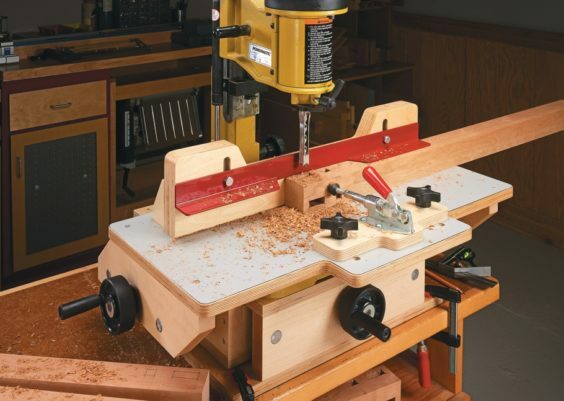 This circular saw guide system is a very good option for woodworkers out there. If you are looking for a complete guide kit, then Ezsmart Track Saw System might be your best pick. This guide comes with a universal saw base which works with left or right circular blades. 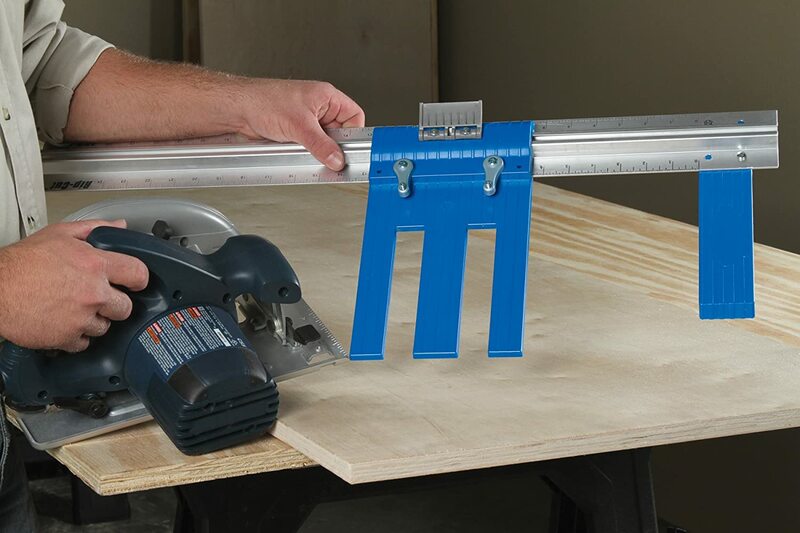 In addition, the guide rail helps you cut straight lines and works perfectly along the saw base. The clamps are useful part to avoid unnecessary movements during cutting. The saw base and inserts are made up of rugged plastic while the rail and clamps are made from aluminum. This kit works well with 6 ½ , 7 ¼ or 8 ¼ inch circular saw blades. It is also available in, 54-inch and 108-inch guide rails. Assembling this kit is not that difficult. All you need to do is attach your circular saw to the saw base and its inserts then attach it to the rail guide. For more specific and detailed setup guide, see videos below. Bora WTX guide is very similar to the E. Emerson Co. C50 guide we reviewed earlier. The WTX guide is not so much of a ruler though since it doesn’t have any measurement scales on it. To get this thing working, you would need to do some measurements and marking beforehand, which wasn’t the case with the C50 guide. This circular saw guiding system is slightly shorter than the C50: it is 50 inches long. It still is quite long though. Possibly the most remarkable feature of this guide is its modular design: you can attach two WTX guides together to get 100 inches of sawing capacity. For extra-long workpieces, this guide may be the best choice available. Because there is a variety of circular saw tracks and guides available out there, it isn’t really possible to give usage instructions and tips that would suit absolutely every guide. A guide like E. Emerson Co. C50 just needs to be pressed firmly against the workpiece and clamped from both sides. With a guide like the Kreg KMA2700, you would need to make multiple adjustments to make sure that the circular saw’s base sits perfectly aligned with the mount and the guide. So while the setup will be unique for each guide, some general usage tips apply to the majority of circular saw guiding systems. The main thing you need to be doing while sawing a workpiece is maintaining control over the circular saw. This, on one hand, is a safety precaution and on the other will allow you to make perfectly straight cuts. You don’t need to rush it: instead, go slowly to maintain straightness and accuracy. The other thing that you need to do is make sure that the guide sits in its place without any movement. Some guides come with clamps and whatnot to keep them secure, but that doesn’t mean that they’ll be 100% secure. The saw guide isn’t made to do the job for you, it is meant to help you achieve more precise and straighter cuts. You still need to maintain control over both the saw and the guide while keeping an eye on their position, so keep that in mind. If you have the tools, the skills, and the patience to make your own circular saw track, then maybe you should dedicate your time to it. A DIY guide would have one significant benefit: it would be made for your needs precisely. If you don’t wish or just can’t spend any time on making a circular saw track yourself, then you should just buy one. And besides, you may simply not have all the tools necessary to make a guide. Creating a guide for your circular saw isn’t the easiest thing to do in the world and should be avoided by beginners. If you aren’t that experienced, then a guide from a store should be more than enough. Line the circular saw on the plywood and mark a line along its inside end (the end furthest from the blade). Measure the distance between the line and the edge of the plywood. Carry the measurement along the plywood to the opposite end of plywood. Take some straight object like a piece of wood or tubing to make a straight line. Align it with the markings you made and trace a line from one end of the plywood to the other. Remove the straight object. Measure the distance between the router bit and the edge of the router base. This will be the distance that will need to be between the straight object and the line you traced. The size of the bit needs to correspond to the width of the track bars you will be using. Set the router bit to take about 1/8 of an inch at every pass. Run the router along the edge of the straight object until you get a track with the desired depth. 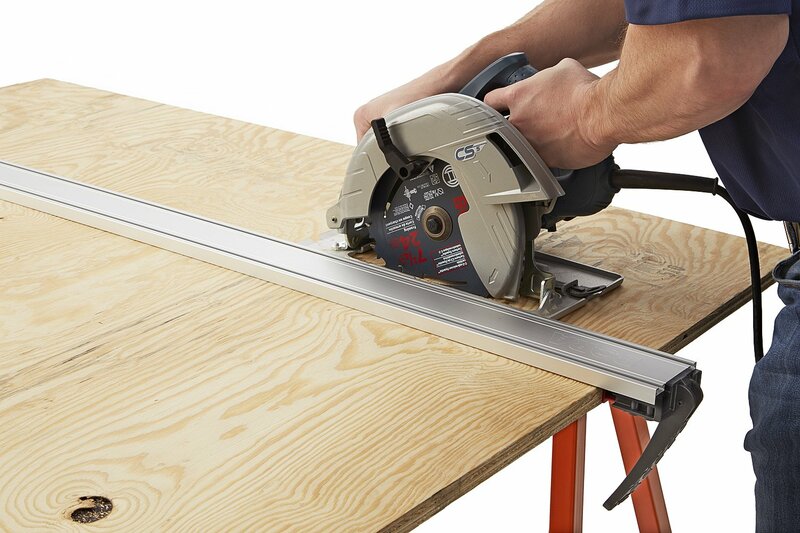 Align the track with your circular saw’s base. Find a location for the second track. Two tracks will ensure more stability and precision while woodworking. Route the second track in the same way you routed the first. The two track bars should now move freely in the tracks. If you notice any tension, try to use some sander paper to smoothen the track. You could also use wax to reduce the friction. You now need to attach the track bars to the base of the circular saw. Drill and tap holes through both the saw base and the bar. Countersink the holes to keep the screw heads flush with the tracks so they don’t interfere with the tracks’ smooth movement. Add the second track bar. Make sure to install it perfectly parallel to the first bar. To do that, you could place a piece of wood between them to keep them parallel. Drill and countersink the holes for the second track. Cut off the tracks of the circular saw base. You may keep them, but you probably should just remove them so they don’t harm you or interfere while you are working. Attach a piece of wood to the end of the track. Glue it first, align it, and screw it in place. This would help you with lining the track with the surface of the workpiece. Cut the track off from the plywood. At this point, the circular saw track guide is pretty much done. If you feel the need, you could sand down the surface of the track in a couple of passes. Run the circular saw through the tracks to test it out. 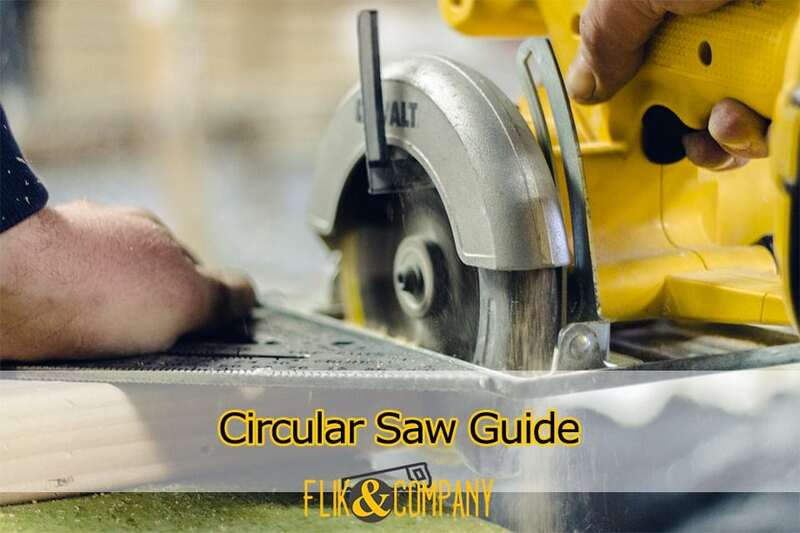 While it is better to have a homemade circular saw guide and track in some cases, you should opt for a manufactured guide for the majority of applications. This would, first of all, save you a lot of time. And secondly, it is quite uneasy to make an accurate saw guide, so you should probably just go and buy one. In the end, if you liked one of the circular saw guiding systems we examined, why not go and buy it? If you don’t need something more, of course!